I just heard about an Intertops Casino player that had an amazing winning streak playing his favourite RTG slots the other night. John R., a VIP player at the online casino, won a total of about $120,000 -- most of it in the free spins features in Pay Dirt ($60,000), Coyote Cash ($30,000) and Texan Tycoon ($20,000). More smaller wins on Shark School, Triple Twister and Mister Money brought the total for the night to six-figures. Imagine! All of these games have symbols that trigger free spins. John had lots of free spins that paid $5000 to $10,000. The biggest was a $17,500 pay out on a free game in Pay Dirt. The 55 year old father of three said that after the first few wins during free spins he realized it was going to be quite a night. Player won most of his $120,000 during free spins. John plans to buy a boat for him and his wife. “It sure is nice to win!” he chuckled when chatting with his Intertops VIP agent. Intertops $240,000 Caribbean Dreams casino bonuses giveaway continues until the end of August. 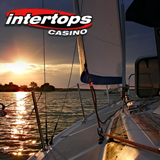 Intertops Casino players earn points when they play and receive bonuses based on their Scoreboard ranking. Every Monday until August 31 players all over the world will collect a total of $30,000 in Caribbean Dreams bonuses. The top twenty each week will be entered in a final $1000 cash prize draw.